Once you’ve mastered a basic vanilla ice cream recipe, take it a step further by adding your own mix-ins. By folding in great ingredients, you can turn your vanilla ice cream into tons of your favorite flavors. Chocolate chip, cookies and cream, and even cookie dough ice cream will be at your fingertips. Combine different mix-ins to replicate your favorite store-bought flavors (try cherries and chocolate chips). There are two ways to add your mix-ins to an ice cream base. The first is to add them while the ice cream is still churning. Add your ice cream mix-ins just before your ice cream is finished. They only need to mix for about a minute. Or, once your ice cream is complete, use a large spatula to gently fold the ingredients into your ice cream. This is a great way to handle more delicate ingredients like fresh berries. It also means you can make one batch of ice cream and turn it into several flavors. This is perfect for families with different tastes. Everyone can have their own special bowl of ice cream. Chocolate chip ice cream is a classic flavor and one of the easiest options. Look for high-quality chocolate chips made of your favorite type of chocolate. Dark, milk, and white chocolate are all delicious with ice cream. In fact, chocolate ice cream with white chocolate chips is a fun flavor combination. Miniature chocolate chips are great for ice cream because they spread out more evenly throughout the mixture. If you are bored of chocolate chips, they make baking chips in many different flavors. Butterscotch, peanut butter, and mint chips are easy to find in the baking aisle of most grocery stores. Turn a popular flavor upside down by adding mint chips to chocolate ice cream. Break up cookies and candy bars into small pieces and they are perfect additions to many ice cream flavors. The most recognizable flavor is cookies and cream, which uses chocolate sandwich cookies. But that doesn’t mean these are the only cookies that work well in ice cream. Bake your own homemade cookies, break a couple up and toss them into a batch of ice cream. Nearly any flavor will work. Candy bars are the same way. You will probably need a sharp knife to break candy bars into pieces unless you use bite-sized candies. Who could resist ice cream filled with M&M’s? While you can make specifically fruit-flavored ice cream, you can also fold fresh fruit into vanilla or chocolate ice cream for something different. Great combinations like chocolate and cherries can be re-imagined by adding cherries to a simple chocolate ice cream recipe. Stick with fruits that have a great texture when frozen. Strawberries, cherries, and blueberries are all good choices. Just give them a rough chop and toss them into your ice cream. Try tropical fruits like pineapple and mango, although you will want to dice these fruits into even smaller pieces. 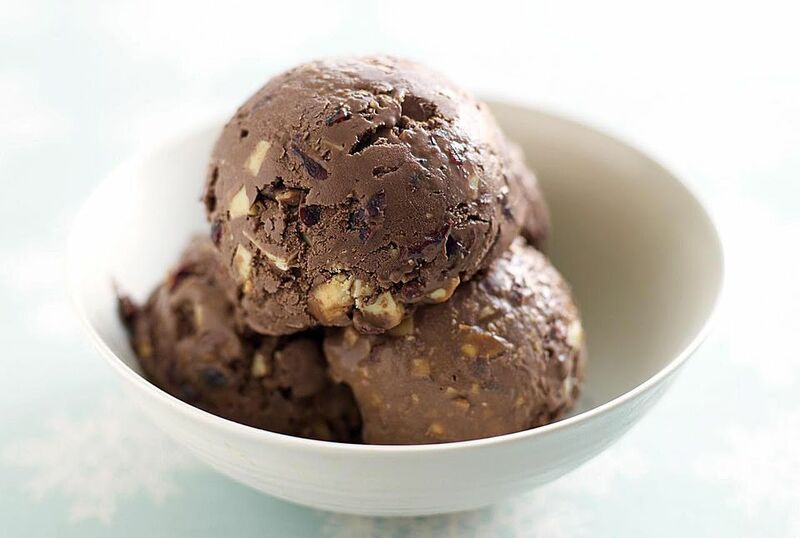 Almonds, walnuts, pecans, macadamia nuts, and cashews all make great additions to ice cream. Think about how they are used in traditional flavors like Rocky Road. You can combine them with fresh fruit or chocolate chips for a different flavor. If you are going to use nuts, lightly toast them before adding them to your ice cream. This will bring out the flavor of the nuts as well as add a little extra crunch to help them maintain their texture in the ice cream. There is something special about cookie dough ice cream. Most store brands use chocolate chip cookie dough and add extra chocolate chips to the ice cream. However, when you make your own you can use any cookie dough recipe you like. Peanut butter cookie dough is a creative alternative, or you could try a basic sugar cookie dough. Look for an egg-free cookie dough recipe when you are making this ice cream, since you will be eating the dough raw. There are tons of recipes for egg-free cookies available. Have fun experimenting and combining these fun flavors into your favorite ice cream base. You don’t just have to stick to vanilla or chocolate ice cream. Any flavor can be dressed up with fun ice cream mix-ins.